I picked up the mandolin and then played a song by Pol Pot. The soldiers said I played very sweetly. MUSICIAN and composer Menh Sothyvann has hit the charts again with a song he wrote several years ago about Preah Vihear temple. His updated version of the song Bopha Preah Vihear became popular after Thai troops attacked Cambodian forces on the border in February. The 52-year-old singer-songwriter first achieved fame in the 1980s with tear-jerker songs such as Louk Srae Cholba (Sell the Farm, Get Money to Enter Bars), Welcome to Cambodia and Where Did You Go Last Night? His romantic songs reflect recent eras of Khmer society and one of the first songs he learned to sing was by Sinn Sisamouth, known as the King of Cambodian Rock in the 1960s. But he had no formal training, having been born in a musical family. Menh Sothyvann was the sixth brother in a family of eight siblings, most of whom were musicians. Because their father was close to the King’s family as an official at the Ministry of Interior Affairs, he had the chance to cultivate his talent. “My father also liked music, but he didn’t make his living from it. In his generation, he was close to Preah Norodom Soramrith [King Norodom Sihanouk’s father] and loved flute playing and flute making. He learned how to make flutes himself but he held another position at the ministry,” Menh Sothyvann said. However, his father died in 1960, leaving his mother to bring up the family alone on her earnings as a wedding planner. Menh Sothyvann learned very fast from his brothers, who were all musicians, and studied music under an American band called Parachute Unit in 1972. “But at that time, I just played American music, rock and roll, and the first Khmer song I learned how to sing was by Sinn Sisamouth,” he said. “Music also saved my life [during] the Khmer Rouge regime,” he recalled. Having managed to survive until 1977, he then came down with dysentery, which had felled many other fellow prisoners. “But luckily one night, it rained and a group of Khmer Rouge soldiers took shelter where I was lying. They tethered their rucksacks near my feet. “I saw one of them had a mandolin, a traditional stringed instrument. I asked a guy if could borrow it, even though I hadn’t played one before. I wanted to hold it even for just a while, because I knew that I would not survive,” he said. “Since I used to play the guitar, I picked up the mandolin and then played a song composed by Pol Pot. The Khmer Rouge soldiers admired me, saying I played the music very sweetly,” he said. Following the fall of the Khmer Rouge regime, Sothyvann became a security guard at the entrance to the Department of Culture, where he met an art teacher who recognised his talent and encouraged him to play. The Department of Culture eventually established its own art department to play modern Khmer music, but it lacked skilled musicians so Menh Sothyvann was asked to play with the band set up to perform. During this time, he met his wife, who was also an artist and wedding planner. 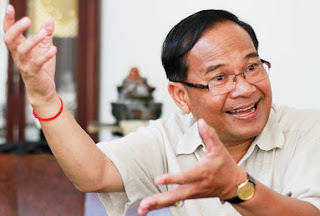 Since then, he has performed Cambodian music in many former communist nations such as Vietnam, Laos, Germany, Czech, Hungary and the Soviet Union. He now has three children, including son Menh Panhasoth, who has followed his father’s footsteps to become a musician. His five grandchildren also display musical talent, said Menh Sothyvann, although the eldest is just seven years old. As president of the Association of Khmer Artists, he aims to foster capable artists and give them the chance to show their abilities. “A number of artists in the provinces have talent but no opportunities, while there are also a small number of artists who have no abilities but producers select them for their attractive appearance,” Menh Sothyvann said. His talent has taken him up the official ladder, last year becoming the deputy director of the Department of Administration at the National Police Commissariat in charge of modern music, and assistant to Prime Minister Hun Sen. He has been a board member of the Association of Khmer Artists since 2007.